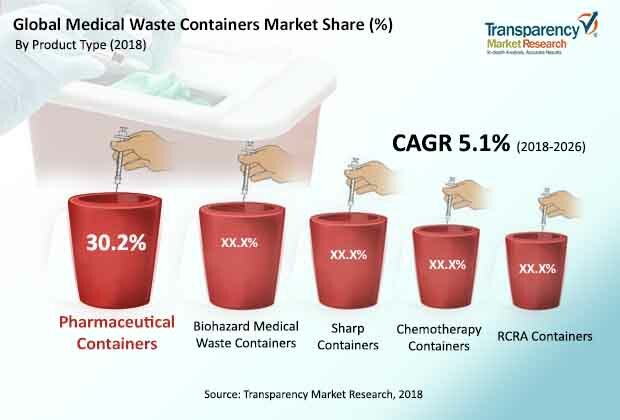 The global medical waste containers market was valued at more than US$ 1,700.0 Mn in 2017 and is projected to expand at a cumulative annual growth rate (CAGR) of over 5.1% from 2018 to 2026, according to a new report published by Transparency Market Research (TMR) titled ‘Medical Waste Containers Market – Global Industry Analysis, Size, Share, Growth, Trends, and Forecast, 2018-2026.’ The report suggests that rise in government regulations for the safe and convenient disposal of medical waste across the globe is likely to spur the demand for medical waste containers in the coming years (2018 to 2026). As key players are emphasizing on strengthening their distribution networks in developed regions such a North America and Europe, these regions are likely to account for a dominant share of the global medical waste containers market. Rise in prevalence of chronic diseases and increase in market penetration of emerging players are likely to boost the medical waste containers market in Asia Pacific at a CAGR of over 5.5% from 2018 to 2026. Rise in number of patients suffering from chronic diseases is a key factor driving demand for collection of medical waste from large as well as small medical waste generators across the world. According to a research article published in the Indian Journal of Pharmacy Practice, drug wastage accounted for 2.0% to 3.0% of all drug costs, representing more than US$ 1.0 Bn in drug wastage in the U.S, thus contributing a large amount of pharmaceutical waste. Rise in awareness about the safe disposal of medical waste, well-developed health care facilities across the globe, and improvement in drug discovery and development by pharmaceutical companies that leads to generation of large amounts of medical waste are expected to propel the global medical waste containers market during the forecast period. The report offers detailed segmentation of global medical waste containers market based on product, waste, medical waste generators, and usage. In terms of product, the market has been classified into chemotherapy containers, biohazard containers, RCRA containers, pharmaceutical containers, and sharp containers. Based on product, the pharmaceutical containers segment dominated the medical waste containers market in 2017 and is expected to remain dominant during the forecast period, due to increased investment by key players in the pharmaceutical sectors and increasing R&D activities in the medical field. The biohazard medical waste containers segment is a prominent segment of the global medical waste containers market. Numerous types of waste generators in the global medical waste containers market are hospitals, clinics & physicians’ offices, long-term care & urgent care centers, pharmacies, pharmaceutical companies, and others. Among these, the hospitals segment accounted for a dominant value share in 2017 and is anticipated to continue to remain dominant throughout the forecast period. This is attributed to the rising number of invasive surgical procedures across the globe. According to a report published by the American Hospital Association in 2015 on waste prevention and management in hospitals, nearly 5,000 acute care hospitals in the U.S. generate around 7,000 tons of waste every day and spend US$ 10 Bn annually on its disposal. This is one of the major factors for the estimated expansion of the hospitals segment between 2018 and 2026. In terms of usage, the medical waste containers market has been segmented into reusable and disposable containers. The reusable segment held a dominant share of global medical waste containers market in 2017, as private players are taking initiatives to develop reusable containers with innovative features such as puncture-resistant and leak-resistant design. In April 2016, U.S.-based Sharps Compliance, Inc. launched the TakeAway recycle system designed for safe collection, return transportation, and recycling of single-use medical devices. Rise in adoption of such innovative medical waste services is likely to drive the reusable containers segment in the near future. In terms of waste, the non-infectious waste segment is expected to hold a leading market share in 2026. Rise in incidence of chronic diseases and increase in medical care provided by health care facilities are factors responsible for the estimated dominance of this segment by during the forecast period. Consistent expansion of the pharmaceutical and health care industry in emerging countries contributes a large share to non-infectious waste, which is likely to drive the non-infectious waste segment of the global medical waste containers market. In terms of value, North America was a leading contributor to the global medical waste containers market in 2017. Emergence of the service sector in the U.S. for medical waste management is driving the medical waste containers market in North America. Europe is a prominent region in terms of revenue in the global medical waste containers market. Geographical expansion of international players in China and India through distribution and licensing agreements with local distributors and suppliers is propelling the medical waste containers market in the two countries at a remarkable rate. Increasing number for health care facilities in Asia Pacific, expansion in the medical retail sector, and rise in demand for safe and convenient disposal of medical waste in Asia Pacific are expected to augment the market in the region at a relatively significant CAGR between 2018 and 2026. The report also provide profiles of leading players operating in global medical waste containers market. Key players include Sharps Compliance, Inc., Henry Schein, Inc., Becton, Dickinson and Company, Medtronic, Daniels Health, Bemis Manufacturing Company, Bondtech Corporation, Terra Universal, Inc., Thermo Fisher Scientific, Inc., EnviroTain, LLC, and MAUSER Group. Entering into strategic tie-ups with multispecialty hospitals is a major strategy followed by key players to stay ahead in the competition.